If you are considering cabinet refacing then you may have thought of doing it yourself. You will find plenty of blogs that tell you it is easy, and plenty of kits that say they include everything they need. The truth is that without the property training and experience, you will not be able to duplicate the look and quality of our refaced cabinets. Even if you had the experience and training, buying the necessary tools and materials can end up costing more than it would have to simple hire us – not to mention how much longer it will take for you to do it yourself. Don’t live in a construction zone, don’t waste money, and don’t settle for low quality: Call Cabinet Magic to provide comprehensive services. You can also keep reading to learn about the long list of tools and materials you would need to do the job yourself. If your cabinets are painted then the first thing you are going to have to do is strip the paint away until you are down to bare wood. To do this, you will need paint stripper, brushes, clothes to prevent damage to your floors, and a mask so that you are not harmed by the fumes. Then you will go through a long and somewhat difficult process of getting the paint off. If we were to list out 100% of the tools needed you would be looking at a very long list. Instead, let us cover the basics, some of which you may have but many of which you would likely have to purchase: Screwdriver, nail gun, electric drill, putty knife, level, paint stirrer, brush, and sponge. 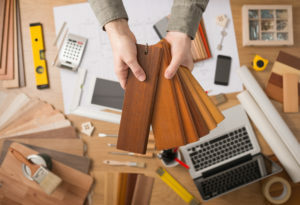 It’s true that veneers are the least expensive options for refacing cabinets but it’s also true there are many different brands and products on the market, all of which are not of the same quality. If you want the best possible results, it is best to work with a company such as Cabinet Magic who can help by providing comprehensive services. If you decide not to use a veneer then you will be staining or painting your cabinets. This requires you to buy costly paint and possibly primer, depending on the state of your cabinets. You will then need to also add a polyurethane sealant or it will easily come off and become damaged. There is no reason to go to the trouble and expense of getting everything on this list – instead, just contact Cabinet Magic and let us handle it for you from start to finish. We will listen to your needs, understand exactly what you want, and provide you quality refacing for less than you may think. Call us at 800-828-4380 to get started.